Crushed, manufactured open-graded aggregates (OGAs) are often used as structural backfill materials for retaining walls, bridge foundations, and pavement bases because of their engineering properties and general easiness to work with in construction. These attributes can lead to better long-term performance of geotechnical and pavement structures. Specifying OGAs for a highway project is typically based on the American Association of State Highway and Transportation Officials (AASHTO) M 43 gradation, which provides standard sizes for processed aggregates; the equivalent ASTM standard is D448 (AASHTO 2005, ASTM 2011). During the design process, the shear strength of these materials is often assumed in lieu of testing the material prior to construction; however, a study conducted by the Federal Highway Administration on common AASHTO M 43 OGAs found that the strength of these backfills is considerably greater than the typical default design value of 34 degrees (Nicks et al. 2015). The measured strengths presented by Nicks et al. (2015) were based on the large-scale direct shear (LSDS) and large-diameter triaxial (LDTX) tests performed on AASHTO OGAs ranging from a size number (No.) 5s to 10s, which were compacted at 30-percent relative density (RD). A low RD was selected to provide a conservative estimate, assuming no compaction; however, in the field, OGAs are compacted during construction, which should yield a higher shear strength. 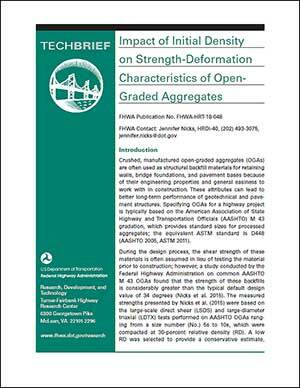 To investigate the strength-deformation characteristics of OGAs under common conditions in the field (at least 95-percent RD), additional testing was performed, which is described herein. A comparison between low and high RD is also presented, and a new default friction angle is proposed in lieu of testing. These results will help designers make more informed decisions on the range of friction angles that are appropriate for crushed, manufactured OGAs, leading to more reliable and cost-effective designs.